This financial product is insured by Korean Deposit Insurance Corporation (KDIC) under Depositor Protection Act. All your applicable deposits, including the principal and any interest accrued thereon, shall be protected up to “the maximum limit of KRW 50 mil “per customer. Any amount exceeding the limit of KRW 50 mil shall not be insured. (provided, however, for automatic re-deposit, the total amount of the principal plus after-tax interest shall be re-deposited) If the account holder cancels the account due to the grounds, such as one’s 60th birthday (60 years old), 70th birthday, 80th birthday, 90th birthday, and 100th birthday (70, 80, 90, and 100 years old, respectively), the basic interest rate shall be the premature withdrawal interest rate. As long as there is an application by the account holder with the account term of 3 years, the principal and interest can be automatically re-deposited every 3 years, and such automatic re-deposit can be applied up to 2 times maximum and it may be deposited up to 9 years from the original account opening. From 00:00 to 09:00 on the 10th day of each month, the pension deposit requirement among the preferential treatment requirements may not be applicable, and thus, please open an account, avoiding this time interval. 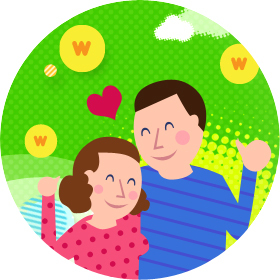 “Woori Youth 100 Years Savings” has been re-named to “Woori We’ll Rich 100 Savings"